What a mess of a first inning last night. Somehow stranding the bases loaded in the top of the first was the least bad part of it all. Luis Severino, with an assist (four assists, really) from Gary Sanchez, allowed four runs in the bottom of the first to dig a daunting early hole. The Yankees could never climb out of it. Understandably, the conversation after the game revolved around Sanchez and the four — four! — pitches that went to the backstop in that first inning. Two were scored wild pitches, but all four could’ve been passed balls. Maybe the first should’ve been a wild pitch because Severino missed his spot by more than the entire width of the plate. Either way, it was ugly. “There were a couple of cross-ups, but, at the end of the day, they were near the zone and I feel I have the ability to stop them, and I didn’t,” said Sanchez following the game. Severino blamed a new set of signs on their problems. It was particularly damning that, after the inning, no one spoke to Gary in the dugout (or at least YES didn’t show anyone talking to him). Mistakes happen and usually there’s a “we’ll pick you up” pat on the behind or something like that. Not last night. Sanchez is a terrible blocker and has been pretty much his entire career. He has a great arm and rates well as a pitch-framer, and prior to this season he was a monster at the plate, so everyone kinda held their nose and looked the other way when a ball got by him. I ran the numbers before the season and found Sanchez’s passed balls led to nine runs scoring last year. Nine. Given everything else he provides, it was a worthwhile trade-off. The bat hasn’t been there this year — hopefully last night’s homer gets him going — which makes the defensive miscues more damning. This isn’t about Sanchez though, despite his terrible night behind the plate. This is about Severino, who had another bad start, arguably his worst of the season. Sanchez’s passed balls make it easy to overlook that Severino allowed four 100+ mph batted balls to the first five batters he faced. Both Brett Gardner and Andrew McCutchen had balls hit over their heads, and Severino’s problems continued into the second and especially the third innings as well. Six runs (five earned) in 2.2 innings is real bad. Hard contact allowed is up and fastball velocity is down. Last night Severino’s heater averaged 96.2 mph. Two things about that. One, only seven starting pitchers have a higher average fastball velocity than that this season. And two, that is Severino’s lowest average fastball velocity in any game since April 2016. For mere mortals, it’s great velocity. For Severino, it is down considerably. I don’t think Severino is hurt — if he is hurt, he’s the first starter I’ve ever seen throw 96+ mph while hurt — but, anytime there’s a decline in velocity, injury is always a possibility. 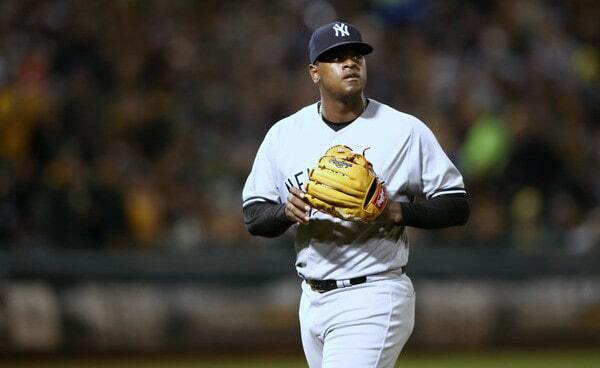 I trust the Yankees are on top of Severino, physically. He’s too important to the team, both short and long-term, to send him out there injured. I think, more than anything, Severino is hitting a wall after last year’s career high workload and shorter than usual offseason to recover. Gives him a nice long 16-day break between starts in September. Allows him to make two tune-up starts before the postseason. Keeps him lined up to start the Wild Card Game on October 3rd. The Wild Card Game starter is very much up in the air right now. There was no sense in worrying about it a few weeks ago. Now we’re at the point where the Yankees have to start thinking about it. And, right now, I don’t see any way the Yankees could give the ball to Severino in that Wild Card Game. His struggles have gone on too long. It’s not a two or three-start blip. It’s a two or three-month skid. Given everything we know right now, the Yankees would have to give the ball to either J.A. Happ or Masahiro Tanaka in the Wild Card Game. I’d trust CC Sabathia in that game as well, though my sense is Happ or Tanaka would be the guy. The final 22 games of the regular season — less than that, really, since the Yankees will need some time to make sure the Wild Card Game starter is lined up for the Wild Card Game — figure to be the tiebreaker. As bad as Sanchez was behind the plate last night — and he was terrible — the larger problem is Severino’s continued fall from grace. He was arguably the best pitcher in the league in the first half and he has inarguably been one of the worst in the second half. I hope it’s just a young pitcher hitting a wall after a big workload last year. Severino wouldn’t be the first young pitcher to go through a lull the year after a career high workload and he wouldn’t be the last. “We have a few weeks for that kind of stuff to unfold and see where we are at and make those decisions. Do I think those two guys are capable of going out and shoving? Absolutely,” said Aaron Boone last night when asked if the Yankees could start Severino and Sanchez in the Wild Card Game. The passed balls get the most attention and understandably so. They are glaring, easy-to-see mistakes. 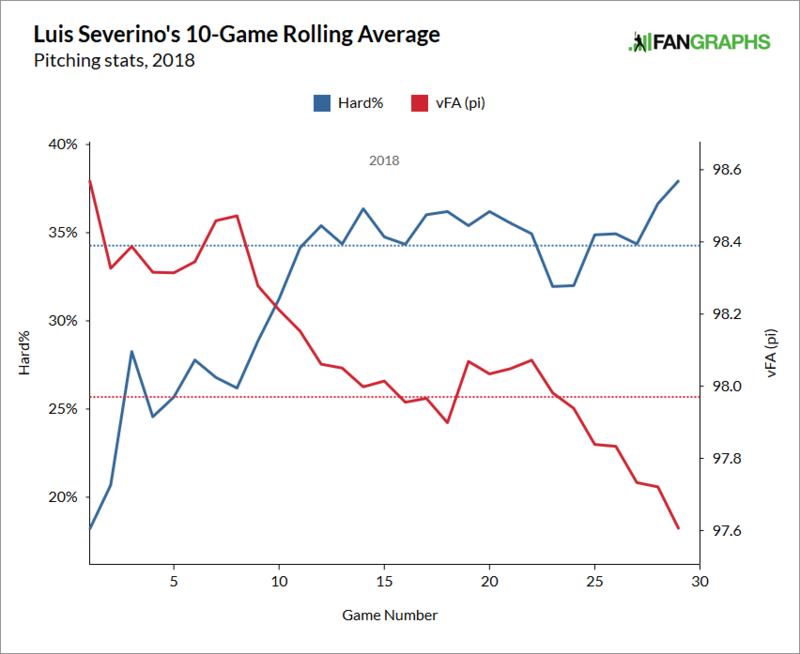 As far as the team’s World Series chances go, Severino’s continued (and worsening) ineffectiveness is the more serious problem. A deep postseason run may not be possible with this version of Severino.